See below how to register and login for the first time. If you cannot see your information, then login with a different search engine, e.g. Internet Explorer instead of Google Chrome. You can now update your information on our database and website pages. Click here to apply for a user name and password to update your personal information on our database (students and members only). If you have problems logging in, then re-apply for your username and password first, to make sure you have the correct username and password. You can watch a short video in our Video Library that shows you exactly what to do! to make sure you will receive the registration email !! Use your ID number to log in. You will receive an email with your login details. Save this username and password for when you want to access your personal information again in the future. Click Here to login in and update your personal information. The Username and Password are Case Sensitive. Also write in your email which courses you have attended, so that we can find you on the database. When you log in you will also have access to downloadable files and programs which are relevant to you. 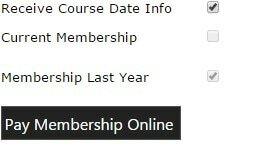 When it is time to renew your membership fees, you need to login to the database. The page with your personal data will appear. At the bottom of the page you will see the [Pay Membership Online]. It will then show how much you need to pay for your membership, depending on where you are in the learning track. Click on this button and it will show you how much you need to pay. ​You can watch a short video in our Video Library that shows you exactly what to do!